Kennedy Trailers is now distributing Panus semi-trailers. Kennedy Trailers has begun to distribute Panus Oceania semi-trailers under a new partnership between the two transport equipment brands in a move to diversify customer offerings. Under the new deal Kennedy Trailers will add skels, flat-top and drop-deck semi-trailers to its current resources and logging market line-up. Kennedy Trailers general manager Cory Kennedy says Panus, which entered the Australian market just over 12 months ago, has goals strongly aligned with his company. "This is certainly a new experience for us," Kennedy says. "But after thorough discussions with the team at Panus, it is clear that there are strong synergies between our two organisations that will allow both our brands to further consolidate our position in the local transport industry and take both businesses to the next level over time." "Most importantly, it will give customers more choice and access to a broader range of value-added transport solutions which in the current market climate, operators are constantly looking to maximise their capital investment." 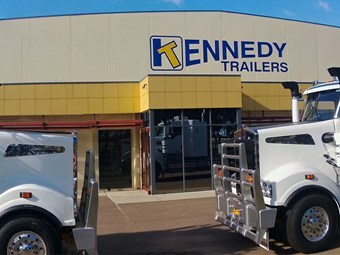 Kennedy Trailers says it has a number of general freight flat-top semi-trailers already and promises more models to be available over the coming months.